Wow! This is a remarkable dish. I made it last night for the first time, and it blew me away. I dream about dishes like this: a slow-braised lamb stew with cubed potatoes and eggplant, and enormous amounts of chopped herbs. The flavors melt together in a clay pot and create an intensely flavored broth. 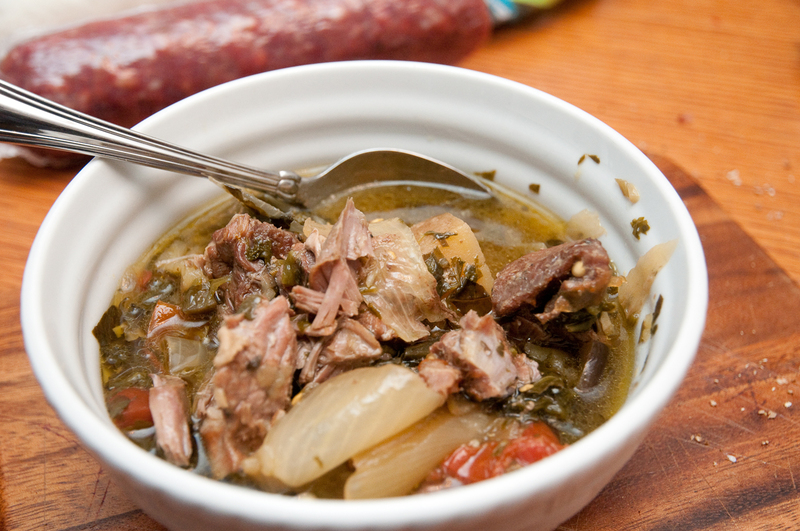 Darra Goldstein, in her fantastic cookbook The Georgian Feast, recommends braising in the oven. But it’s also an ideal recipe for a Crock Pot. Just make sure that for this recipe, you’re using at least a 6-quart pot. The 4-quart variety isn’t nearly big enough. 1. Preheat oven to 300° F. Melt the butter in a 3-quart casserole (preferably earthenware). 2. Coarsely chop the garlic, hot pepper, cilantro, and basil, and combine. 3. Place half the lamb in the casserole and season with salt and pepper. Layer half the onions, eggplant, potatoes, chopped herbs, and tomatoes on top of the meat. Repeat with the remaining ingredients, keeping them in separate layers. Pour in the water, cover the casserole, and braise slowly in the oven for 4½ to 5 hours. Using a slow cooker: Set the cooker to high temperature and layer the ingredients as instructed above. Instead of melting the butter in advance, slice it into pieces and place half on the bottom of the pot and half on top. Allow at least 5 hours to cook. Be careful not to over-stuff the pot, as this will increase the cooking time. This entry was posted in Main Courses, Soups and Stews and tagged Georgian, Lamb by Baron. Bookmark the permalink. Baron, Brilliant idea to use a Crock Pot. I got a clay pot in Georgia to make this kind of stew, but never actually used it and the lid has gotten lost in one of my moves. I will have to try your version.